In a developing market where miniaturization of designs has become critical, operating frequencies of magnetics have been increasing in order to minimize their size. 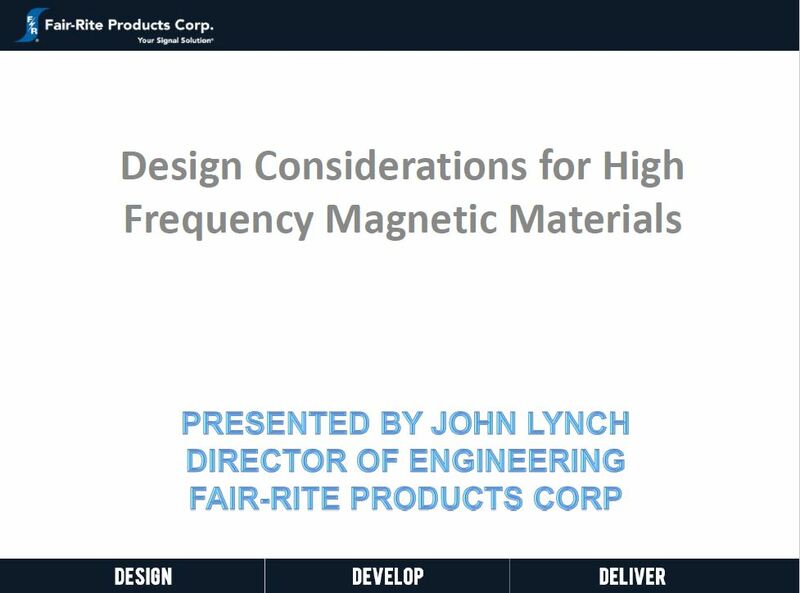 As a result, engineers have a lot to consider when selecting magnetic components for their designs. Join us with John Lynch, Director of Engineering at Fair-Rite, as he discusses the role of ferrites in power supplies. John’s presentation will address the advantages of ferrites in power supply designs, the important parameters of ferrite materials, the impact of these parameters on performance, guidelines to select your ferrite material, and optimizing configuration based on design limitations. Fair-Rite Products Corp., Your Signal Solution®, introduces a roadmap of their 67, 79, and recently developed 80 materials. Be the first to join John Lynch, Director of Engineering at Fair-Rite, as he leads an informative presentation on the capabilities of the materials while also discussing the effects of size on their overall performance. The recently developed 80 material, in particular, is showcased in the video as the solution to the gap the 67 and 79 materials had previously left in frequency coverage. Fair-Rite is excited to share with you how these three products can empower your design. Please watch our video to learn more. Ferrites are ceramic components that can be used to suppress electromagnetic interference (EMI) in certain applications. 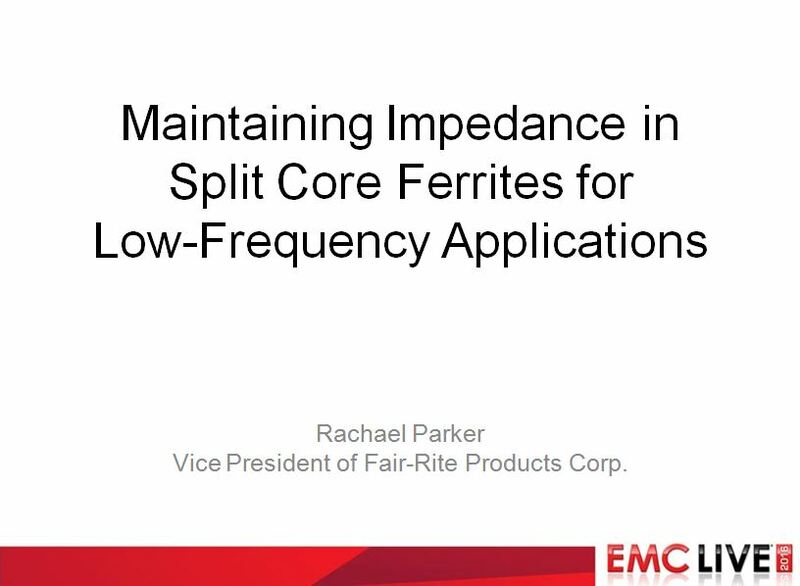 This presentation will discuss the basic properties of solid round ferrite cores, the impact an air-gap can have on the performance of these cores, and special considerations. In particular, this discussion focuses on the use of high permeability materials, such as Fair-Rite’s 75, in low-frequency suppression applications since its permeability is relatively high compared to other soft ferrites used for this purpose, making the effect of an air-gap much greater. Posted By Rachael Parker, Vice President Fair-Rite Products Corp. 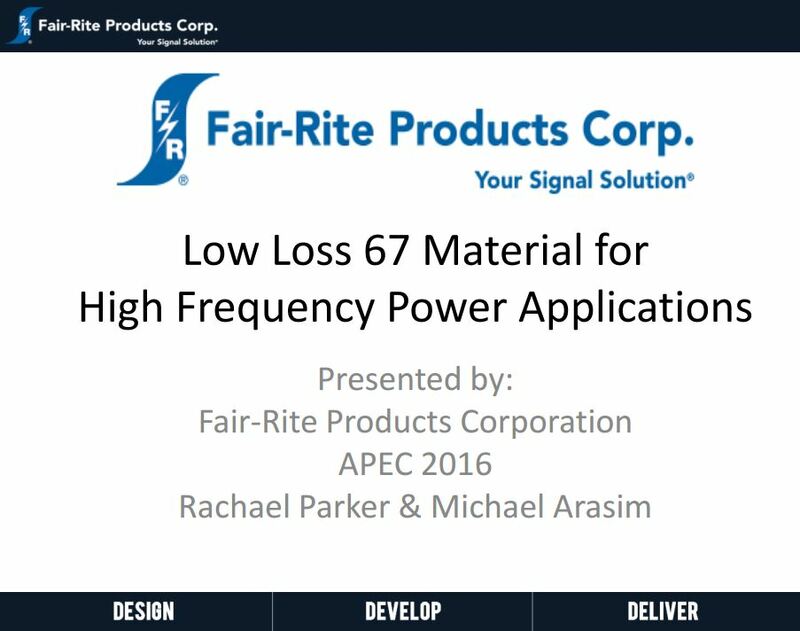 This presentation was given at APEC 2016 on Low Loss 67 Material by our Vice President Rachael Parker. Click on the presentation to view. Would you like the raw data used for the graphs in the presentation? This video discusses the basics of ferrite beads and their uses for basic filtering applications. It discusses and demonstrates how ferrites act as resistors at high frequencies and how this is used for EMI/RFI Suppression, improved power supply filtering, parasitic oscillation suppression, and others. The affect of the frequency dependent resistive characteristic of the ferrite beads is demonstrated by showing its effect on a swept RF signal, its effect on the rise/fall time of a digital signal, and its effectiveness of eliminating parasitic oscillation.